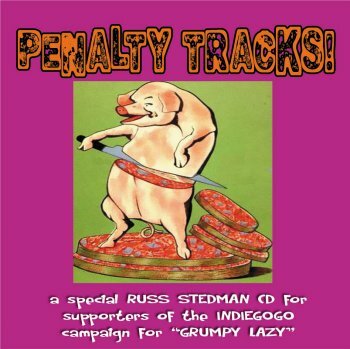 Last year, Russ Stedman started an Indiegogo campaign to get his "Grumpy Lazy" album released. The album counts 9 tracks. 9 powerful guitar tracks. Title number two is a fine rendition of Frank Zappa's 'Montana' with an excellent distorted guitar solo. December 2013, Sycomore Films started a crowdfunding campaign for a movie called "Ritual Of Pope Decapitation". The movie was born of our meeting with the producer Xavier Filliol, great connoisseur of the Freaks and friend of Carl Franzoni. Xavier Filliol introduced us to Gail Zappa in Los Angeles, who was very enthousiast in watching our movies. She gave us her consent and support to use musical materials from her husband. The crowdfunding campaign of December 2013 had to cover the investments in new shootings and post production costs.The minimum amount required was 35 euros. As a counterpart of this support, contributors received a box of 4 DVDs with 52 episodes of the serie The Apparatus. If contributors gave 50 euros or more, they'd also get the DVD of Ritual of Pope Decapitation. With this campaign, with your support (over 500 contributors), we reached the amount of 32,000 euros. One year after, following shootings and a long editing time, we realized that we won’t « put our elephant in a shoe box ». 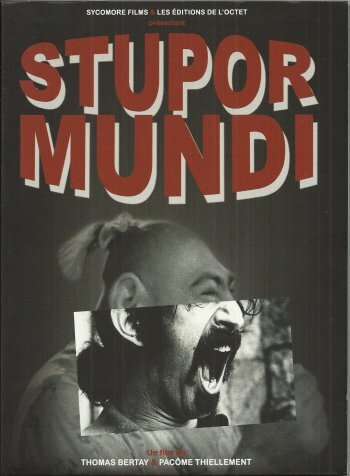 So, it’s not one but 4 movies that we decided to release, gathered under the title STUPOR MUNDI. The topic is not only Zappa and the Freaks but « A History of EVERYTHING (and its monsters) ». And since last April, the two first episodes have been screened at several festivals. To be quite honest, I had forgotten all about this documentary and its crowd funding campaign. I did remember receiveing the box set with "The Apparatus" episodes in 2014, but the package with "Stupor Mundi" that arrived last week came as a surprise. The box can hold 2 DVDs, but only 1 DVD was included. This disc presents the first two movies : "Ritual Of Pope Decapitation" (a reference to pope of LSD Timothy Leary, who has his head stored in a fridge somewhere), and "Men Who Devoured The Mountain" (being the yuppies who took over Hollywood and the music industry and everything else). A film by Thomas Bertay and PacômeThiellement. Music by Frank Zappa. Not the easiest stuff to watch but very impressive. 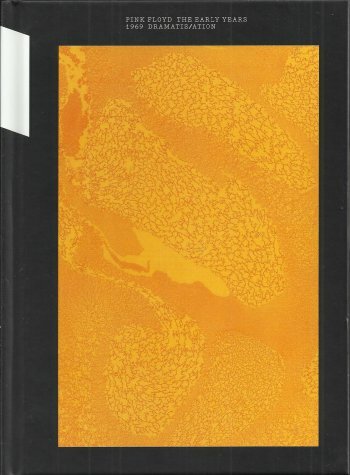 Includes interviews with Frank Zappa, Gail Zappa, Carl Franzoni (one of the early L.A. freaks) and Trey Spruance (of Secret Chiefs 3), plus some concert fragments of Zappa's band. Great package with a superb cover mixing a shot of the "Freaks" movie with FZ's yawning face from "Chunga's". Those who missed the original crowdfunding, can still order this documentary. Check out : http://stupormundi.tv/ for all the details. New album, with recordings from 1991. 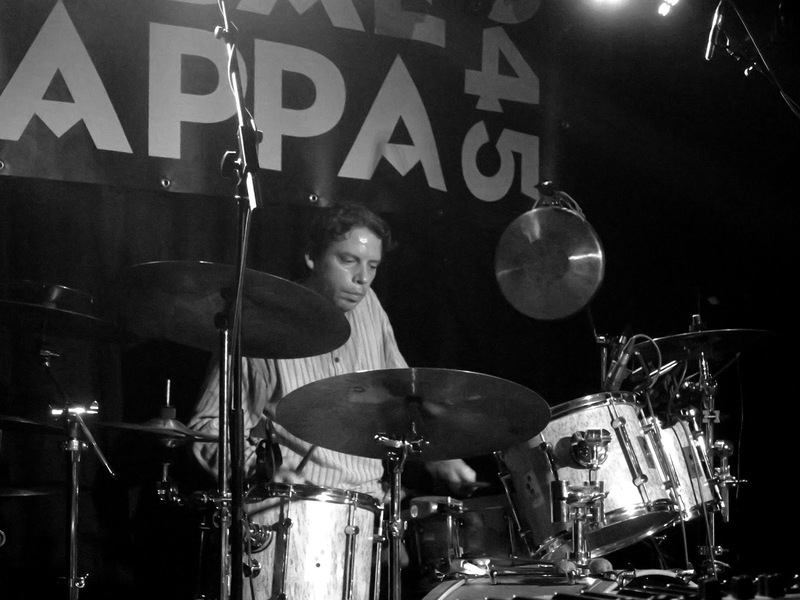 The group NASA NA, made up of Pierre Van Dormael, Fabrizio Cassol, Michel Hatzigeorgiou and Stéphane Galland was formed in 1989 at the time of the opening of ‘De Kaai’, the legendary Brussels jazz club. There, all risks were permitted, and a series of musicians experimented together with a new kind of music. Initially called NASA NA GROUP, which means ‘I have a group’, NASA NA developed naturally, creating great cohesion between its members. When the group broke up in 1992, Fabrizio Cassol, Michel Hatzigeorgiou and Stéphane Galland formed AKA MOON, and Pierre Van Dormael would join them on a few occasions for concerts and recordings. Orchestra Exotica is releasing a first album in about two months. I went for the 2CD edition. It has a couple of alternate versions on disc 2. El Negocito Records is releasing a new album by the 1000 quartet. 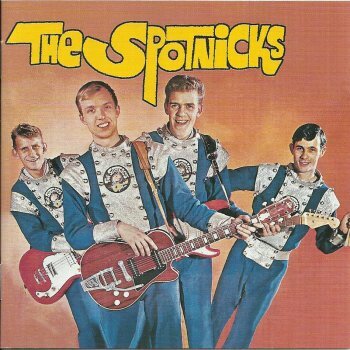 The Spotnicks' recording of Frank Zappa's 'Duodenum', (or (the theme from) 'Lumpy Gravy' as they called it) can be found on various compilation albums. 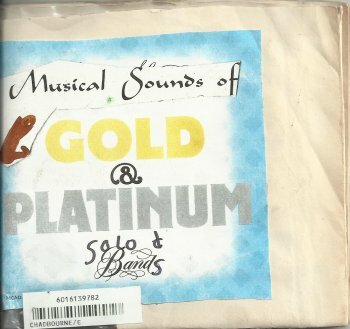 I recently found another one: this "Rare Collection" 2CD set from 1999. 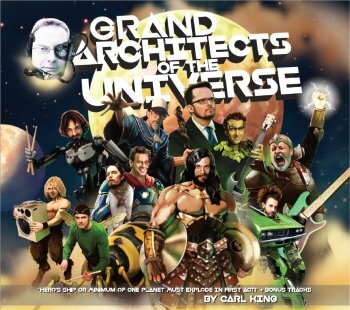 In the meantime, Carl King's "Grand Architects Of The Universe" arrived. I had been listening to the download, but having the actual CD in your hands, does have that someting extra. 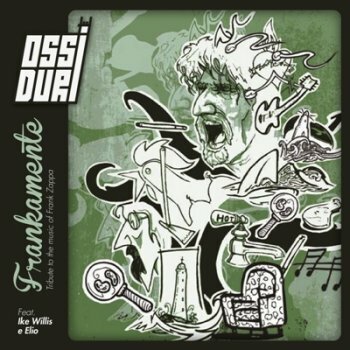 A superb musical science-fiction epos that features Dweezil Zappa, Mike Keneally, Phi Yaan-Zek, Marco Minnemann and Morgan Ågren, just to mention the most familiar sounding names. Next to his enormous output on CDR, Eugene Chadbourne does have albums released by record labels as well. One of these is "The Hills Have Jazz". In the liner notes, Eugene tells the story of how he visited L.A., got to borrow Wes Craven's vintage Gibson acoustic guitar, and of how he and Richie invited a couple of L.A. jazz musicians to participate in the recordings. Great reading and the music's even better. space jazz reverie (sun ra) !! 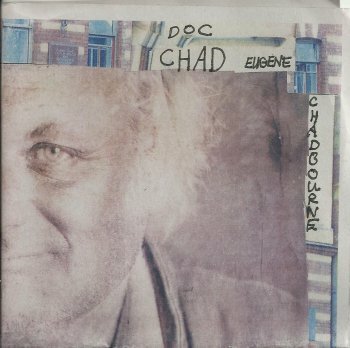 Eugene Chadbourne released two album by his Doc Chad Contemporary Rock Band last year. Both present recordings of the tour he did with Jan Fitschen (bass, baritone guitar) and Dieter Schroeder (drums). This is a great show. Great musicians and funny as well. Eugene mentions Jimmy Carl Black in the lyrics of 'I Used To Be Somebody'. It includes Sun Ra's 'The Satellites Are Spinning' in the set list. 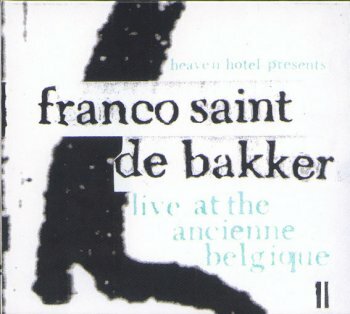 A couple of years after "Live At The Ancienne Belgique" (a concert hall in the city of Brussels), Franco Saint De Bakker released the follow-up, aptly called "Live At The Ancienne Belgique II". No Sun Ra classics or Raymond Scott tunes this time, but another fine selection including a number of excellent original compositions. I really like 'Saar van de Leest's 'Sarly's Theme' !! All names that you've heard before when bands like Flat Earth Society, Nordmann, DelVitaGroup, Manngold de Cobre, Yves Peeters Gumbo or the Opus 2 Brass Band were mentioned. Wonder if they know any Zappa tunes? That should be fun !! 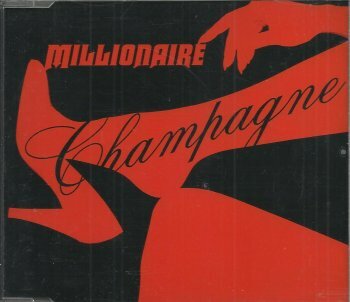 Did I already mention the brand-new Millionaire album? In times where one gets satured by info by e-mail, by facebook, by twitter and whatever else, it's hard to differenciate the informative messages from the garbage. Let alone keep track of the interesting info. The large quantity of info also causes today's news being old news tomorrow. 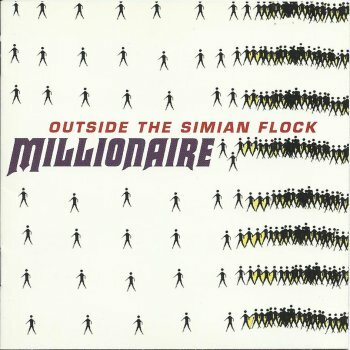 So let me get back to the new Millionaire album. "Sciencing" is a very impressive album. I've been playing it a lot the last couple of weeks. The album has 12 songs on it and they're all quite different although they all bear the Millionaire signature. The biggest surprise was the opening track, 'I'm Not Who You Think You Are'. The guitar solo (near the end of the song) sounds like it's played by Frank Zappa. Wow. Didn't expect that ! Switzerland has a new source for music from obscure and underground bands. It seems like Bela Bartok is getting some renewed attention. Sinister Sister Announced a number of concerts where they will be performing the music of Bela Bartok in a jazz / rock setting, and more recently, Dialeto has released an album with Bela Bartok compositions. 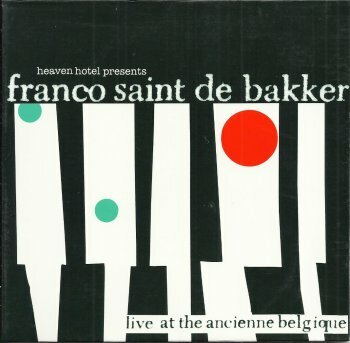 Franco Saint De Bakker is a Belgian collective that unites rock musicians from various bands and ensembles to perform contemporary versions of jazz standards. 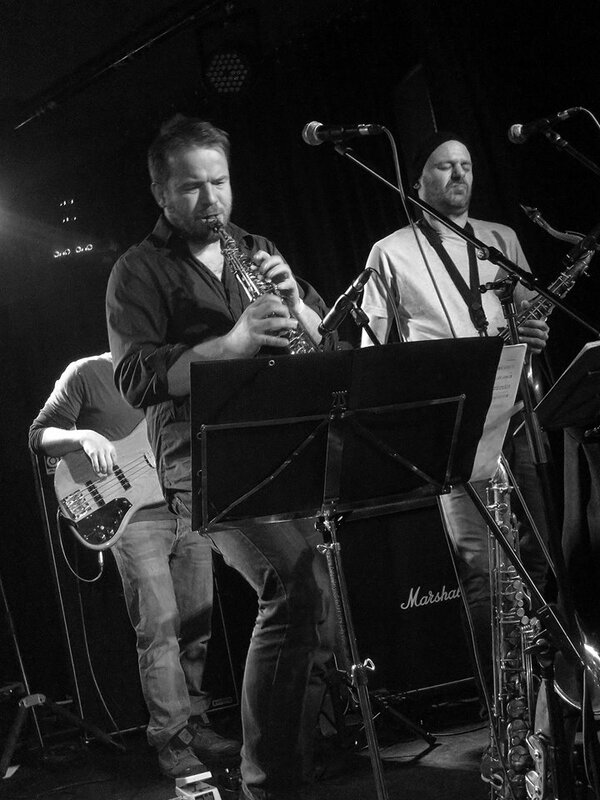 The band got formed by Elko Blijweert (Kiss My Jazz, Dead Man Ray, Rudy Trouvé Septet, Gruppo di Pawlowski). 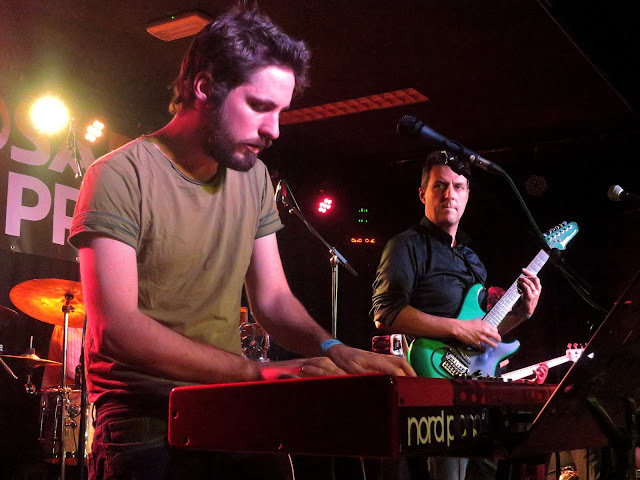 Together with Rudy Trouvé, Elko runs the Heaven Hotel record label. Other members include Saar Van De Leest (Tip Toe Topic, Traktor, Capsule), Joris Caluwaerts (Zita Swoon, Stuff, ...), Sigrid Van Roosendaal (Lionell Horowitz, Rudy Trouvé,...), Karel De Bakker (Dead Man Ray, Manngold,...), Frans Van Isacker (various jazz combos) and Thomas Sainderichin. This first release (from 2004 already) includes a beautiful version of Raymond Scott's 'Powerhouse' and a breathtaking 'Angels And Demons At Play' from Sun Ra. 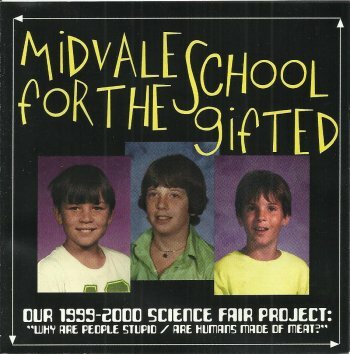 midvale school for the gifted: our 1999-2000 science fair project - why are people stupid - are humans made of meat? Three students from the Midvale School For The Gifted sent a demo to one Ed Furniture. They blew up their school shortly after that. Ed was impressed and released their demo on an album. So far the quite funny story behind this Carl King / Sir Millard Mulch project from 2000. The album is quite good so it had to be added to the United Mutations Archives. Experimental / avant garde rock ! 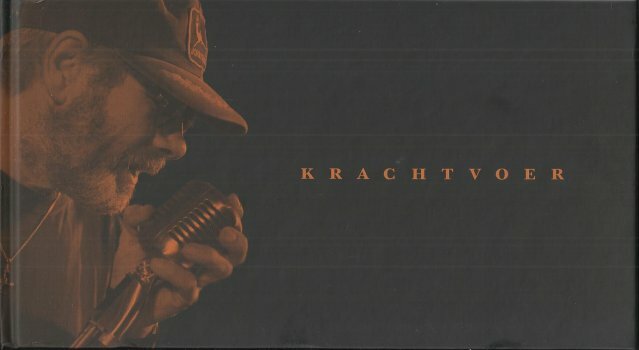 "Krachtvoer" (powerful food) is a book about / is a tribute to Dirk van der Pijl. The late Dirk van der Pijl was an inspiring musician and person. In 2008 a couple of his closest friends decided to publish a book as a tribute. This book includes two CD's, beautifully incorportated in the inside of the back cover. As Dirk was the lead singer for White Beans and as White Beans had done a couple of Frank Zappa shows, both of the discs have a couple of tracks of the White Beans performing Zappa. A couple of these tracks have been previously available on a couple of White Beans albums, but another three Zappa tunes are unique to this release. A beautiful tribute. Both to Dirk van der Pijl and to his affection for the music of Frank Zappa. Parts of the Pink Floyd "Early Years 1965 - 1972" box set have recently been made available. As the "Dramatis/ation" included the Frank Zappa / Pink Floyd jam at Amougies, I couldn't resist. It's all (4 discs) housed in a nice package and comes with a booklet with a bunch of pictures. 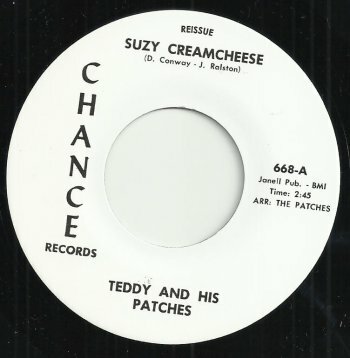 Somewhere in 1967, Teddy & His Patches released a 7" with 'Suzy Creamcheese' on the A-side. No coverversion of a Zappa tune, but an original composition that uses some FZ lines. ... Recording sessions generated two tracks, including "Suzy Creamcheese", a bizarre tune written by Conway and promoter Jerry Ralston. The song was inspired by the opening dialogue—which "Suzy Creamcheese" features Flores mysteriously reciting—taken from the Frank Zappa composition "The Return of the Son of Monster Magnet". 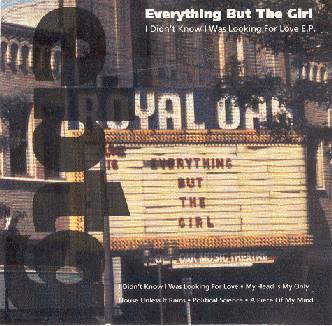 Well, this very rare 7" has recently been reissued. If you take a closer look at the above picture, you can see that it says "reissue" on top. An illegal reissue? Yes, but with the original going for more than US $ 100, and this reissue being available for about US $ 10.00, it's not that bad a deal. The Ed Palermo Big Band played another stunning gig at 'The Falcon' in Marlboro, NY, earlier this months. An audience recording of these shows can be downloaded from Zappateers. 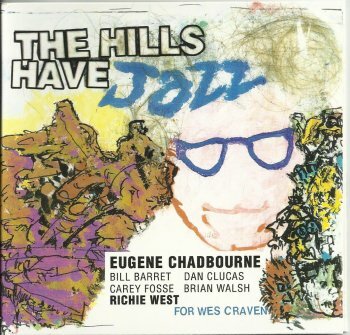 Here's another recent title from Eugene Chadbourne. Recorded in concert at the "Monkey Bar", this fine album presents 16 marvellous tracks. If anyone has a copy of "Record Store Day", you could make both me and Doc Chad very happy with a copy ! Get in touch !! 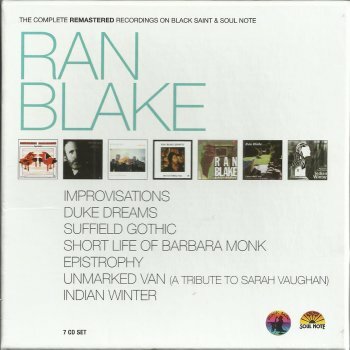 Remember the Ran Blake / David Fabris "Indian Winter" album? It included their version of Frank Zappa's 'Marqueson's Chicken'. Ran Blake on piano and David Fabris on guitar. Well, this very album has been re-released (in a remastered edition) as part of the above shown box set. Another fine edition to The Others Of Invention, bands and artists performing the music of Frank Zappa. 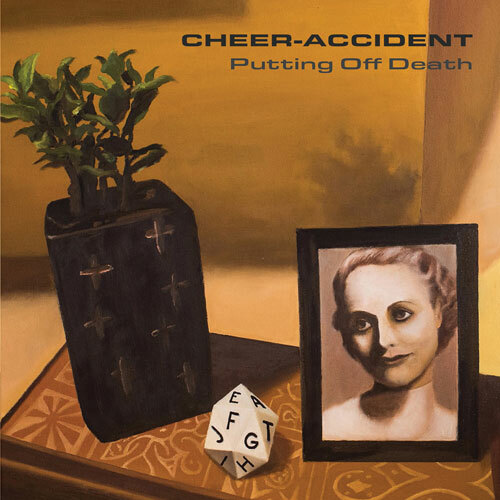 Cheer-Accident is an experimental rock band. They have been making music for about thirty years and have released twenty-something albums. Notwithstanding their 'non-commercial' music and the rapidly changing music industry, the band is still around and has produced a brand-new album. And despite the title, Cheer-Accident sounds more alive than ever. "Putting Off Death" collects seven pieces. Not your ordinairy love songs but beautiful, endearing compositions. 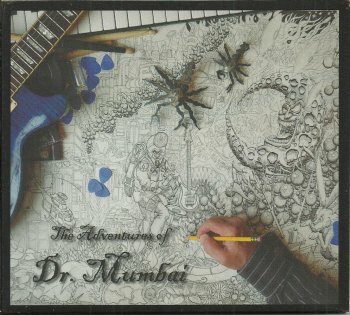 Bill Pitts (= Dr. Mumbai) released "The Adventures Of Dr. Mumbai" a couple of years ago. A beautiful album with lots of nods to Frank Zappa. It features a lot of familiar sounding names : Marco Minnemann, Arthur Barrow, Aaron Arntz, Scheila Gonzales, Bryan Beller, Pete Griffin, Dweezil Zappa (!! ), and Billy Hunting. A fine discovery. Why hadn't I heard of this before? Eugene Chadbourne's solo concert at the "Apostisis Festival" in St.Petersburg, Russia. It includes Doc Chad performing Don Van Vliet''s 'Orange Claw Hammer'. Eugene Chadbourne's latest release is entitled "2017 IWW Band". Besides the fact that this is a very fine album, I should also mention that it includes the band performing Frank Zappa's 'Take Your Clothes Off When You Dance'. The song starts with a recording of Jimmy Carl Black talking about his early life and then kicks in to a wild version of 'Take Your Clothes Off'. Here's the data for the bootleg with The Nice that included the BBC Top Gear Sessions with the band performing Frank Zappa's 'Lumpy Gravy'. Good news from the publishing company. 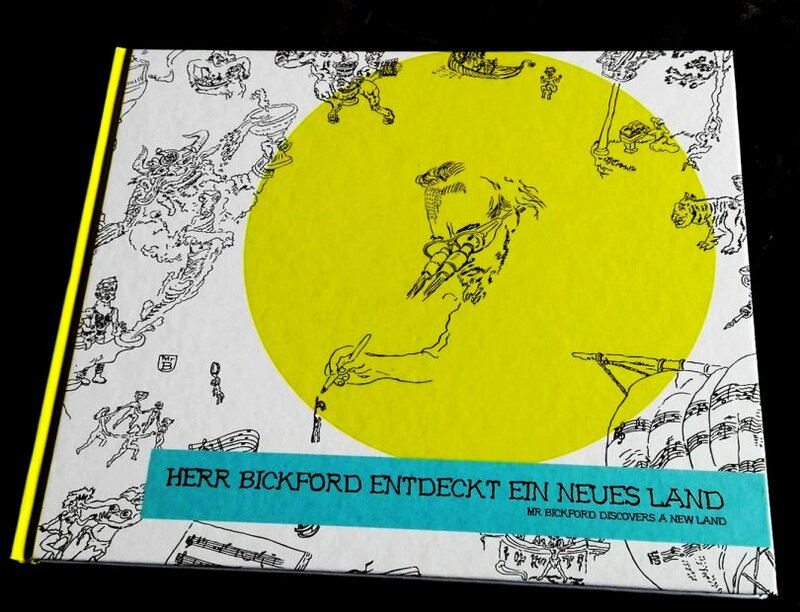 The Bruce Bickford exhibition catalogue (for his expo that is running in Germany right now) should be available to order from June 21 onwards. The ordering page is setup, but not all the links are working yet. The reason for me to check out Dimesland (or to Land Of Thin Dimes as the band was originally called) came from Nolan Cook. Nolan plays the guitar for The Residents. On record and on tour. During the last years, Nolan Cook's guitar playing has added a very recognisable, typical sound on The Residents' recordings. Clean, long, floating notes. A sound that fits The Residents perfectly. His work on Dimesland is quite different. Dimesland is a metal band. The guitar is a lot heavier and more energetic. Not something that I would consume on an empty stomach. 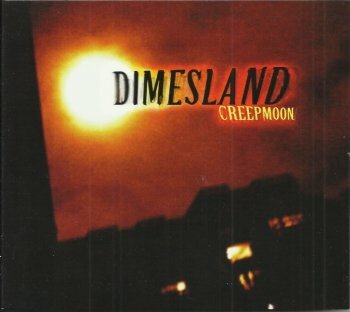 "Creepmoon" is a 15-minute mini album that got released in 2012, a couple of years before their latest "Psychogenic Atrophy". Here's one of their more recent songs. It will give you a pretty good idea of what Dimesland is about. 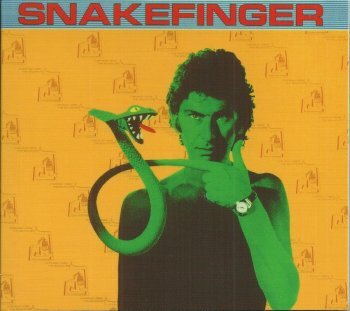 Next to his contribution to various Residents records, and to some Clubfoot Orchestra albums, Snakefinger released three solo albums. 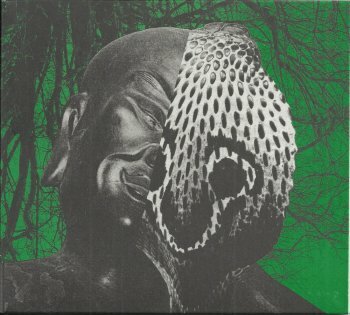 All three, "Chewing Hides The Sound", "Greener Postures" and "Manual Of Errors" have recently been re-released by Klanggalerie. True, the album is from 1979 and it has been re-released on both vinyl and CD in the late eighties and nineties, but just in case that you don't already have it (or that you need an extra copy), this Klanggaerie re-issue is excellent. Perfect sound, great package and a couple of bonus tracks (from early singles). 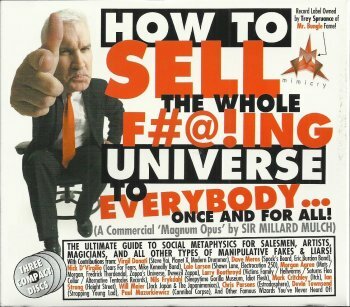 Sir Millard Mulch's (or Carl King's) "How To Sell The Whole F#@!ing Universe To Everybody..." is (and I'm paraphrasing) : "the ultimate guide to social metaphysics for salesmen, artists, magicians, and all other types of manipulative fakes & liars". Features Morgan Agren on drums and Lale Larson on keyboards. 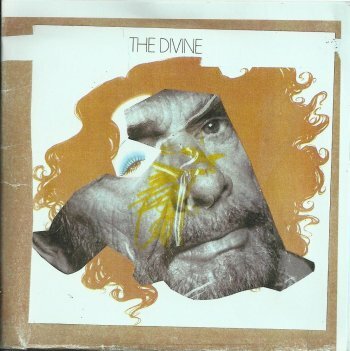 "The Divine" got released by Doc Chad in 2016. It offers pieces of the solo concerts that he did at the Beacon in New York and at the Apostisis Festival in St.Petersburg, Russia, plus a couple of tracks with a band. Fine material, and an excellent choice of tunes ! 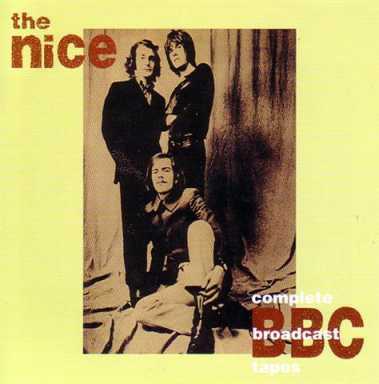 August 6, 1968, The Nice (Keith Emberson's band) recorded Frank Zappa's 'Lumpy Gravy' for a BBC Top Gear session. The sessions got broadcast on August 25 of the same year. The recordings got released in 2002, but could already be found on a bootleg album. 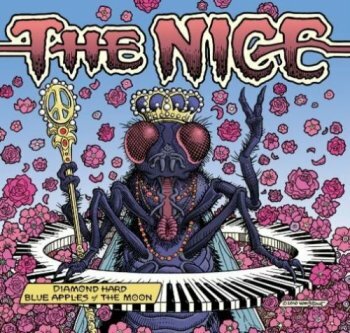 The above pictured album, "Diamond Hard Blue Apples", offers recordings from various concerts and radio sessions from 1968 to 1970. It also includes 'Lumpy Gravy'. Minnesota quintet Bubblemath is Kai Esbensen (vocals, keyboards), James Flagg (vocals, drums), Jon Smith (vocals, guitar) and Blake Albinson (guitar, keyboard). 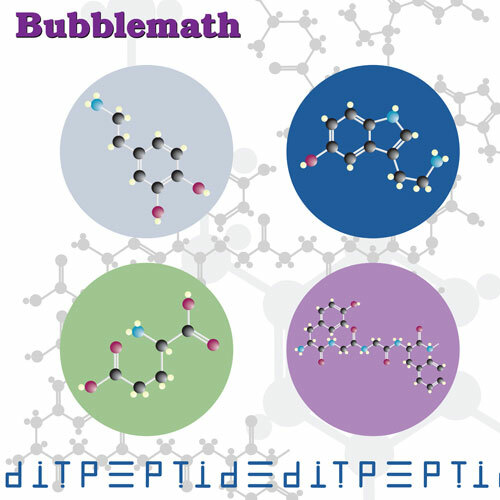 "Edit Peptide" is their second album. It follows "Such Fine Particles Of The Universe" that got released in 2002. Rhythmically challenging, melodically impressive and vocally top notch, "Edit Peptide" is sure to make some eyebrows move. The music is could be considered experimentel progressive, yet it sounds so poppy. The Yellow Snow Crystals are getting ready for Zappanale ! Saturday, July 01. 2017, the band will be playing in Aachen. 25 Jazz and Beyond Jazz tunes from 25 artists from 25 different albums released on MoonJune Records between 2011-2017. 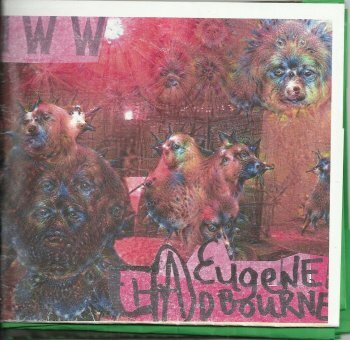 I recently bought another set of albums by Eugene Chadbourne. You may know that Eugene is a perfect example of a contemporary DIY (do it yourself) artist. He writes and performs his own music but he's also not scared to perform pieces by other artists. Music that is part of his history, his life. 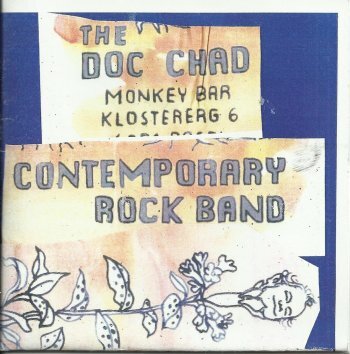 As Doc Chad has a good taste in music, this usually translates in familiar sounding tunes or fine discoveries. The recognizability depends on the quirky arrangement and/or the instrument that he is playing (guitar, banjo, rake, umbrella,...). "Musical Sounds Of Gold And Platinum" has Eugene performing solo, in trio, and even with his Doc Chad Contemporary Rock Band. Lots of great tunes, including Don Van Vliet's 'Orange Claw Hammer'. Very nice. The CDR comes in the typical unique packaging: recycled / collage LP covers with the info written all over it. 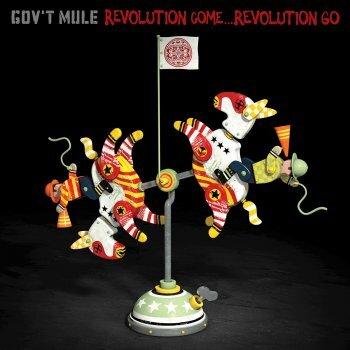 Gov't Mule will be returning to the old continent next October / November. With a show in Amsterdam on October 31. Here's their recent tribute to Gregg Allman. Next to the trombone, sax and trumpet, and the bass and drum rhythm section, the London Horns feature Mike Outram on guitar. Beautiful jazz rock / fusion. Originally released as a download-only album, but more recently also available through Amazon as a cd-on-demand. A fabulous Zappa tribute concert by Ossi Duri, with special guest Ike Willis as icing on the cake. I added a bit of extra data to the Millionaire entry over at the United Mutations Archives. 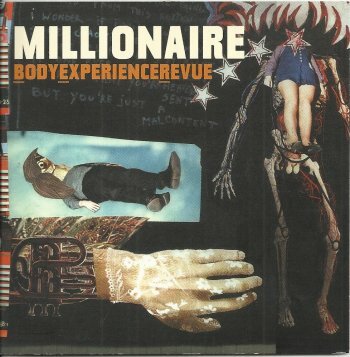 Does it show that I like Millionaire ? The shady Keyhole label will be issuing another Frank Zappa concert. 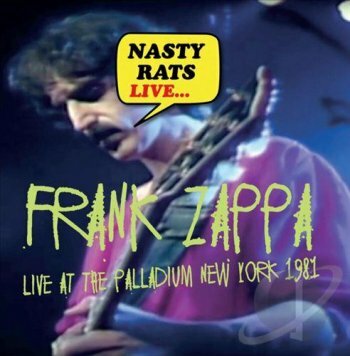 It will be a 2CD set of the October 31, 1981 Palladium concert, called "Nasty Rats Live..."
Last week, I told you that there's another edition of Mosae Zappa 045 being prepared. Again at the 'Oefenbunker' in Landgraaf, NL. I added a picture of the superb concert poster to the United Mutations Archives earlier today. 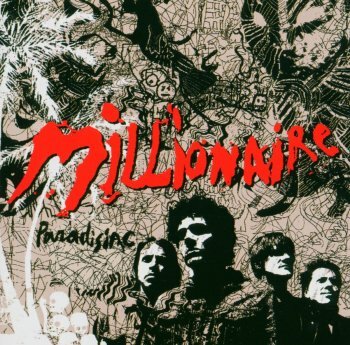 Belgian band Millionaire has a new album out. It's their third album in sixteen years. What better way to celebrate than to give their previous one, "Paradisiac", a couple of spins. An energetic rhythms section, guitar-driven songs and devilish vocals. Here's the opening track : 'I'm On A High', written by Tim Vanhamel and Mauro Pawlowski. Every Zappa fan should be familiar with Paul Hubweber as he is the driving force behind The Yellow Snow Crystals, a band that brings Zappa's music in a fascinating, playful way. 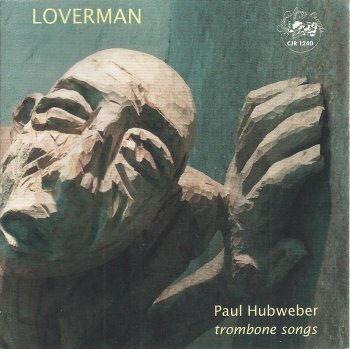 In 2010, Paul Hubweber released "Loverman" a solo trombone album on which he performs original tunes next to Charlie Parker classics. One of the original pieces, 'Evelyn', is in fact Frank Zappa's 'Evelyn, A Modified Dog'. Excellent CD, beautiful artwork (sculpture by Bele Scholz) and a superb Zappa piece. A fine way to start my Sunday. Cazzurillo hails from Milan, Italy, or Grinchland as she calls it. 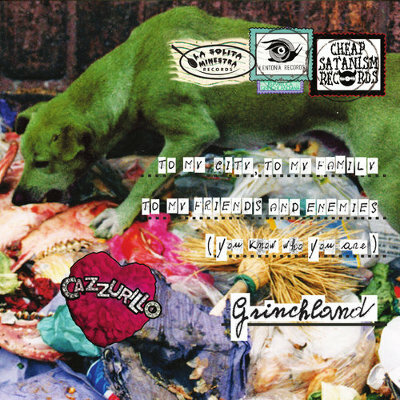 "Greetings From Grinchland" presents eleven quirky, experimental tunes. Almost pop, or not. 'Bunny's Bed' is the last track on the album. It will give you a fine idea of what Cazzurillo is about. It fits the disturbed album cover / greeting card. The Music On Vinyl label is releasing a Raymond Scott tribute album : "The Portofino Variations". In concert in Antwerp tonight. You know what's coming up? Some gigs! Here's them. On June 4 and 6 there are a couple of Extreme Cream shows with Kofi Baker and Rob Pagliari. Playing with us at Brick by Brick is instrumental progressive band Pet Shark, and their cellist Lindsay Jagich will join us on one of my favorite Jack Bruce pieces, "As You Said" from Wheels Of Fire. Cream themselves never played this piece live  I am really excited about playing it! I love it a lot. On June 22 I'll be doing a clinic at Murrieta Arts Studios in Murrieta, CA. I've not been to this place yet, but Pete Griffin did a clinic there not so long ago and he told me this place is happening. So this will be a new experience for me and I am very much looking forward to it, like a baby fish looks forward to Infinite Day. Starting in mid-July I'll be doing various things in Europe  for one thing, a trio gig with Stu Hamm and Chad Wackerman somewhere in Europe (the precise location and date are being kept a secret from the public for a few more weeks. Exciting!) where we'll be playing Stu's stuff, a little of mine, some Zappa, Satriani, Vai, Holdsworth  a cornucopia of wonderments. Then I'll be out and about in Germany and Italy for a couple of weeks with comrades Jaan Wessman and Schroeder  those details are still being sealed in wax and will be presented with love to you quite soon. There's going to be a gig somewhere in South America with some fine musicians we all know quite well which I see has not been announced online yet, so I'll keep my trap shut on that. As indicated above, west coast BFD August action is in the planning stages. There's also some Extreme Cream touring in the blueprint stage for sometime around September/October. Late October I'll be returning, with relish, to Progtoberfest III at Reggie's in Chicago. Last year was a hoooot and I look forward to further hooting. I'll be doing a set with BFD, and another set sitting in with the Don and Bunk Show (Don Preston and Bunk Gardner  freakin' legends), along with several other wonderful people, the also legendary Ike Willis and Nick D'Virgilio. Jack and Jim, better known in real life as Eugene Chadbourne and Jimmy Carl Black, toured Europe in 2003. They included a lot of Zappa material in their setlists, a lot of which can be enjoyed in the various recordings that the both of them released afterwards. 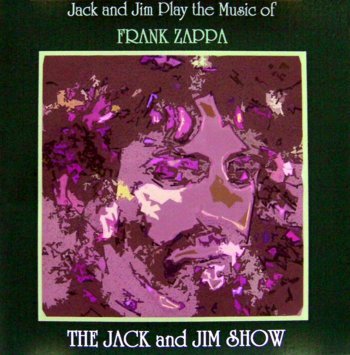 "Jack and Jim Play the Music of Frank Zappa" was a compilation album, combining Zappa compositions from various earlier releases. Unfortunately, I don't have a copy of this album myself, but Spencer was kind enough to send me a picture (that he had found on Jimmy Carl Black's website). 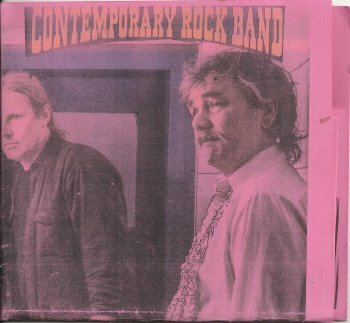 If my memory serves me right, Jack and Jim released their "Play The Music Of Captain Beefheart" around the same time. Another 'compilation' that I skipped at the time. I've mentioned Carl King's "Grand Architects Of The Universe" a couple of times already the last couple of weeks. It's Carl's latest project that not only presents some fine original music but also features some fine guest musicians (Mike Keneally, Phi Yaan-Zek, Dweezil Zappa, Marco Minnemann and Morgan Agren). The very same Carl King is also the man behind projects like Sir Millard Mulch, or Dr. Zoltan Obelisk. The above picture is the album cover for Sir Millard Mulch's "The De-Evolution Of Yasmine Bleeth". It got released some ten years ago and it's great. It hops between genres and it's more a play than it's a music album. Did someone say 'Weird' or 'Bizarre' ? Ham Sessions is a small music festival that is held in Ghent, BE. Actually, it's held in the garden of Michel Mast to be more precise. Three days of music. Not subsequent, although two of the three days are part of a longer weekend in May. This year's edition is taking place right now : the previous Sunday, today, and tomorrow. I was there last weekend and had a blast. Every year, the Ham Session team produces a promotional CD as a 'thank-you' for the participating musicians, contributors, helping hands, etceteras. 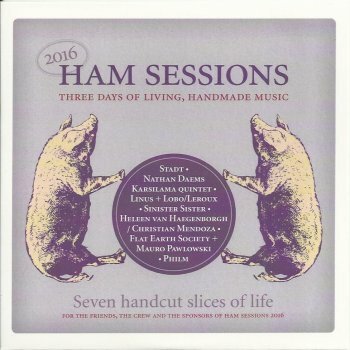 This CD presents material that got recorded during the Ham Sessions concerts. This year's edition (with material from the 2016 Ham Sessions) has Sinister Sister performing Frank Zappa's 'Inca Roads'. Nothing less than superb. And if that wasn't enough, the album ends with Flat Earth Society (with Mauro Pawlowski) performing 'Drstkova Polevka'. Beautiful. A limited number of copies of this album are for sale. And tell them I told you about it. This EP included a fine jazzy version of a Don Van Vliet / Captain Beefheart original : 'My Head Is My Only House Unless It Rains". Klanggalerie is combining new releases, re-issues and special items when it comes to Charles Bobuck and to The Residents. "Clank Clank Clank" is the 4th installment in the TOOK series. This time, Charles Bobuck presents his demos for a redo of the first ever Residents album, "Meet the Residents". Recorded in 2014, the project was shelved, but Klanggalerie has now put them on CD. This is what Hardy Fox says about the recordings: "In the midst of writing music for The Ghost of Hope back in 2014, Charles Bobuck had what he thought was a musical epiphany, The Residents were very focused on their 40th Anniversary and he felt that a special 40th anniversary album should be released. The train wreck album seemed fine but very removed from the anniversary celebration. So he proposed an album about the Meet The Residents LP from 1974. It would be new material but include versions of the songs from Meet the Residents cobbled out of samples taken directly from the original recordings. It would be autobiographical. It would include stories and memories from making the recording forty years earlier. The idea was received with little interest. In response, he decided to record some demos to show what the new arrangements could sound like. Still, the idea did not catch on, and neither did The Ghost of Hope which was shelved due to the touring schedule, so Bobuck started working on What Was Left of Grandpa and the demos were filed away. Three years later, 2017, Hardy Fox and Walter Robotka were figuring out the Hacienda Bridge newsletter schedule and subjects. They wanted to do an issue on robots, AI, computer music - that kind of thing. Walter asked Charles Bobuck if he had any music that would fit into that theme for a CD to go with the issue. He remembered that he had the demo redo’s of Meet the Residents that used a lot of hi-tech computer driven splicing and syncing. Hardy and Walter agreed the demos should be released. After a bit of reworking, they were fashioned into an EP CD called Clank, Clank, Clank. It is the sound that robots make when they dance." Personally, I love the idea of redoing or rethinking an album from 40 years ago. Especially whent it's done by the same artist. And this little album sounds great ! "Clank Clank Clank" got released in a very limited edition of 300 copies. It sold out a couple of days after it became available. 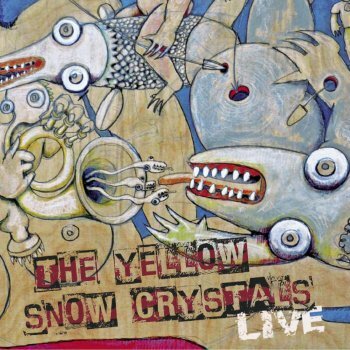 German band The Yellow Snow Crystals are famous for their open and experimental versions of Frank Zappa compositions. On top of that, they make up their own lyrics, inspired by the originals. In German. 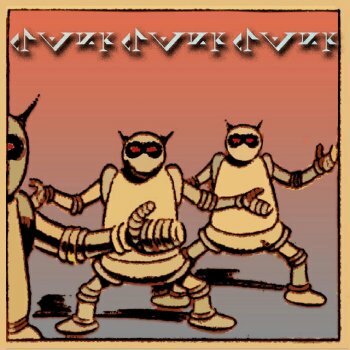 Later this month, The Yellow Snow Crystals will release a new album. Just look at the fabulous album cover. Now that would make an impressive art print. And in July, the band will be performing at Zappanale. 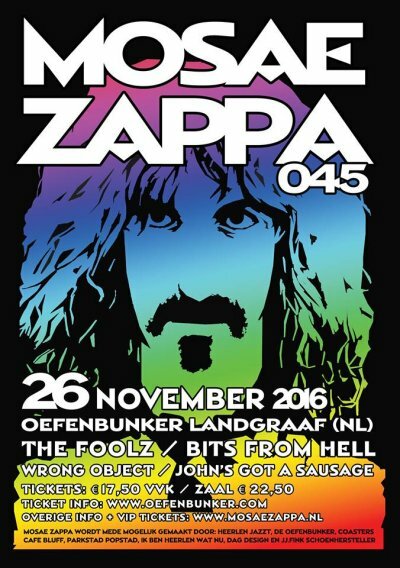 The latest edition of the Mosae Zappa festival took place in Landgraaf, NL on November 26, 2016. The festival had some warm-up parties and gigs but the actual festival started in the evening. - John's Got A Sausage. They were fun. It was obvious that this was their first gig. But still, fun. Top band. Great performance. This concert made the trip worthwhile. A couple of superb original tunes plus a lot of superb verstions of Zappa songs. Great band, but scheduled way too late. What I heard sounded good but I left after a couple of songs because it was getting too late. Lots of people were leaving. Even local folks. Too late is just too late. Here's a bit of extra data on the concert by The Wrong Object. I saw Aka Moon in concert the other day. At the Côté Jardin festival in Ghent (BE) on the 28th of May. Fabrizzio Cassol on saxophone, Michel Hatzigeorgiou on bass, Stéphane Galland on drums, and guest for this concert, Fabian Fiorini on piano. They performed material from their latest (and excellent) album, "The Scarletti Book". Aka Moon will be releasing a new album later this year, plus, to celebrate their 25th anniversary, a box that will collect all their older albums !! Here's a fragment from last year, live at Le Triton. The Mothers Of Invention's "Absolutely Free" will be re-issued on vinyl on September 29. This double 180-gram LP version will include the original record mastered by Bernie Grundman cut directly from the original analog master tapes and a second disc with 20 minutes of rare and unreleased bonus material, including the “Why Don’tcha Do Me Right?”/“Big Leg Emma” single as well as vintage remixes, and radio ads from The Vault on side one and a laser etching of Zappa’s visage from the album cover on side two. The package features Zappa’s original layout and a reproduction of the rare, highly sought-after “libretto,” an 18-page booklet with a foreword by FZ and lyrics to all the compositions, that was offered only by mail order when originally released.